NOTES: Stars D Jamie Oleksiak was a healthy scratch in his first game against Pittsburgh since the Penguins traded him back to Dallas in January. The Stars sent Oleksiak to the Penguins in December 2017. Both deals involved a fourth-round pick. … Not long after scoring the game’s first goal, Guentzel was stopped on a one-timer right in front of Khudobin. 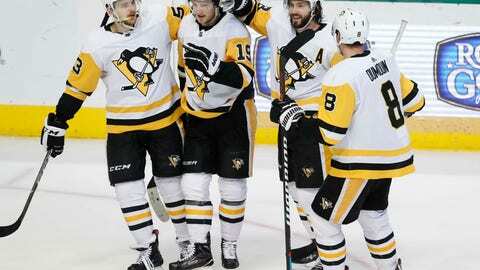 … The Penguins had a goal waved off in the second period when Blueger was called for goalie interference after Erik Gudbranson’s shot from outside the circle beat Khodobin.